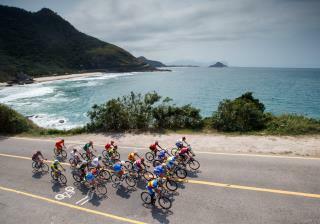 (Newser) – An Iranian cyclist died after crashing in a road race at the Rio de Janeiro Paralympics on Saturday. Bahman Golbarnezhad, 48, received emergency treatment on the course and was transported to a Rio hospital where he died, reports the AP. "This is truly heart-breaking news, and the thoughts and condolences of the whole Paralympic Movement are with Bahman's family, friends, and teammates, as well as the whole of the National Paralympic Committee of Iran," International Paralympics Committee President Philip Craven said in a statement. "The Paralympic family is united in grief at this horrendous tragedy, which casts a shadow over what have been great Paralympic Games." The IPC said it believes this is the first death in a Paralympics. Should've taken up the wing-suit.